(This page and the images have been copied from www.L32.jbrems.dk with permission). 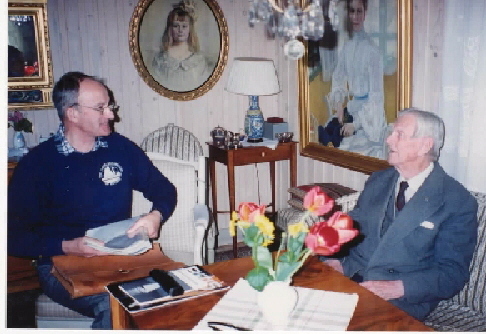 Arvid Laurin was born October 3, 1901 in Lysekil on Sweden's west coast where his father was the owner and manager of "Skandiaverken" which made heavy combustion engines. He trained as a civil engineer at Chalmers in Goteborg and graduating with the highest mark. He was able to put his new-found knowledge and theories to the test in his father's plant where he designed new engines. During his military service in the Swedish Navy he learned to fly and studied aerodynamics. In the 1930's he was asked to help improve sound recording in films and designed improved electrical equipment in this field. He was hired by Bolinder-Munktell and soon after was appointed Chief Designer for their huge diesel engines. He began sailing when he was 13 and got his first sailboat. He changed the boat's design and improved the cut of the sails and did the same for other boats in the "Regatta Fleet" whose speed he was able to increase. Soon followed his first design commission which was a modest fishing vessel. He was asked to design a Lottery boat, which in those days was a popular thing for yacht clubs to do. This had to conform to the "Koster rules" and the resulting boat was so much faster than other Kosters that orders for more Kosters came pouring in. In the 1930's he began racing Star boats becoming the champion helmsman in the class. Chosen as a member of Sweden's Olympic sailing team in 1936 he returned with a silver medal, which would have been gold had he not had bad luck in the final race. From Stars he moved up to the 5 Metre Class in which he also became a top helmsman. Feeling he could design a faster model he created Gullmar III which was nicknamed, "The Box". Other designs followed and Swedish yachtsmen complained, half in jest, that he had "ruined" the class because to have a chance to win it was essential to have one of Laurin's designs. His design won gold in the Helsinki Olympics in 1952 and four years later in Melbourne. He began to design in the 6 metre class and the one he built for himself called "Trickson VI" won him the Gold Cup Regatta in Sandhamn. Next came his interest in the new 5.5 metre class and the success of his yachts drew orders from all over the world. Many of these won World Championships and Olympic medals. In time he and fellow racing skippers married and had families so their need was for fast, seaworthy, cruising boats and Arvid began designing his "modern" Koster boats. Later Arvid Laurin explained his objectives in the construction of his Kosters: "I wished a seaworthy and strong boat, which at the same time did not look like a cigar box. By deploying the whale deck - which was done sometime in the forties - the strength was further increased. In the beginning these were designed specifically for the owner's requirements and were "One-offs". Thus developed the successful L28 which was originally built in wood and later in glass fibre. In 1963 he designed the first Koster boat specially for glass fibre construction and became known as the L32. Later he would add an L38 which went into limited production. Laurin designed an experimental boat for his old friends Carl and Ulla Frostell which they named "Carousel" from a combination of the names. This was followed by an other experimental boat for himself called, "Gullmar VII" which the Frostells would later own. Having transom sterns they were not Kosters but were very ingenious,fast and seaworthy. Before his death in 1998 Arvid entrusted all his designs to Carl Frostell, who arranged for them to be preserved in the "Sjohistoriska Museets Samling" (Maritime Museum). These can be viewed at the museum whose telephone number is +46 (0)85195 4900.